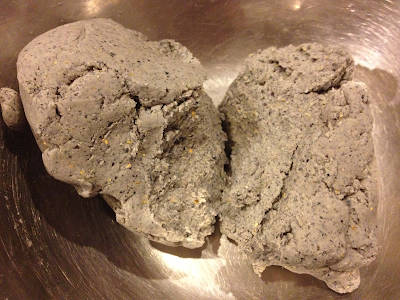 The ingredients listed for the blue masa was "organic blue corn, trace of lime". It turns out this did not mean the type of lime that looks somewhat like a green lemon, but rather referred to slaked lime, or an alkaline solution of calcium hydroxide. Upon further research, I discovered that the process of preparing corn in limewater is called nixtamalisation, and ancient civilisations have been doing this as long ago as 1200-1500 BC! This process not only improved the flavour and colour of the corn, but provided niacin, which unprocessed maize is deficient in. European settlers did not adopt the same process, leading to poor people in the southern US developing pellagra in the early 20th century. To be honest, this flour from blue corn did not look so much blue as a kind of pale grey. I decided that I would make corn tortillas with it, using the recipe on the packet, and serve it with a vegetarian bean chilli. This is no stew for the poor, as I went and bought such exotic and expensive ingredients as dried ancho poblano chillies imported from Mexico, and the organic masa harina was pretty dear to begin with! Blue masa, chipotle peppers and ancho poblano chillis, which cost me $11.50, $3.09 and $7.49 respectively. To make tortillas combine 500g of masa, 1 teaspoon of salt and 300ml of warm water to form a dough. Roll the dough into equal sized balls and press each ball flat to about 4mm thickness. Cook tortillas on a pre heated frying pan for 30 seconds on each side then stack them on top of each other and wrap in a tea towel to stay warm. It sounded pretty simple, but I had questions straight away. How big should each dough ball be, and how hot the pan? Do you use oil? And 4mm sounded awfully thick! Recipes on packets generally turn out well though, I reasoned, as companies want you to keep buying the product, so I ploughed on ahead. I made a rather dry and hard lump, which looked very different from the description and pictures in Mexico in my Kitchen. The dough was a bit hard even when I added more water. I ended up adding significantly more. I tried flattening the dough balls between two sheets of baking paper, pressing with a saucepan on top of a chopping board. Because the dough was so hard though, it didn't really want to spread, and I had to flatten it a bit more with a rolling pin and before putting it on to cook. As you probably guessed, it was a failure. The heat did not transfer well to the dry lump, and the inside of the tortilla did not cook through, at least not in the short timeframe suggested. First attempt at a blue corn tortilla did not turn out well. I tried adding more water to make a softer dough, I played with the heat, and tried actually making a 4mm thick patty, but no matter what I did, nothing seemed to give the result I was looking for. Although I heated some for as long as 5 minutes, the insides never seemed to cook properly. The most edible versions were those that I pressed thinner, but even they were not particularly inspiring. I only managed to make one tortilla that puffed up a little bit. A lot more practice required, methinks! And maybe with cheaper ingredients first. Chilli sin carne, served with blue corn chips. My chilli fared much better, but also lacked a depth of flavour. Perhaps it will improve overnight, as the recipe suggested that it would. [Added 10 July 2013: It's amazing but true. This went from something slightly anaemic to a full-bodied, sophisticated chilli after a week.] I managed to rescue my tortillas by chopping them up into triangles, and baking them in the oven until there were no more wet dough innards. Although they were now edible, they were definitely more hard than crisp. I shall have to trawl the internet for tips and tricks, before attempting to make corn tortillas again. This post is part of Our Growing Edge, a monthly blogging event aimed at inspiring us to try new things. This month it is hosted by Chandler from The Chef With Red Shoes. Duck liver mousse sounds divine! Nice try, even if it didn't work out. I've never tried making tortilla, hope you find some tips and tricks that help! Your tortilla chips look convincing though. Perhaps you could just call them nachos? They would look great contrasted with a white chili (chicken and white beans, green chiles and cheese). It's been exactly 1 month since our visit to Wellington and we loved eating our way through the city. p.s. Thanks for joining Our Growing Edge this month. Thanks for the encouragement and suggestions, Genie! The chips actually had a good flavour, though the texture wasn't quite right. And I managed to improve the chilli too, by adding a mild sweetener in the form of malt extract. Never tried a white chilli before - I'll add that to my to-do list! Thanks again for organising. I picked up a tortilla press online a few years ago when I first started making asian dumplings (I've learned to roll my dumpling skins properly since then) and it definitely makes it easier to get the tortillas thin enough! I got my press off ebay for about $20 including shipping (the cheapest ones I could find in NZ were around $40 - $60)- if you love tortillas could be worth investing in a cast iron version but my little aluminium one is lasting quite well. Thanks - I did think the 4mm suggested by the packet sounded ridiculously thick. Do you use masa harina only, or do you also mix in some wheat flour? I definitely need to give this another go, though I don't think I'll be making these often enough to justify buying a press. bubble up a little, all in about 30-40 seconds, then flip it and cook the other side, pressing down on the tortilla to make it puff. That will flatten out but it make the tortilla lighter. As you cook, pop them into your bowl and cover it with a plate. It is a bit frantic but I always shape and then cook straight away to avoid the rolled dough going dry. One other thing to remember is that corn tortillas are smaller than wheat flour ones so don't try to get them to dinner plate size. These come out a bit smaller than a bread and butter plate. Do try again....like anything, first time is usually the worst, and good luck. Wow, great tips and very detailed instructions, thanks! I'm certain it'll be a success next time. I've made my own corn tortillas for the past 15 years or so as taught by an authentic Mexican! If you can not get proper masa harina it is possible to simply use coarse cornmeal (finer than polenta though). The trick is to mix the dough with boiling water. I don't measure, I just keep adding water and mixing 'till it is about right. You want a slighlty rubbery, springy sort of texture bordering on sticky. This dough will not roll easily so a press or squashing it with a board is a must. I use a slit open plastic bag with oil to prevent sticking to the press. Good luck! Thanks for the advice, Felix! I definitely need to give this another go. What do you eat your tortillas with?